Okay, so big news on the house hunting front. We have been looking since we sold our house. But, we were having a hard time finding exactly what we wanted. So, while we've been looking, we have been living with Worker Man's parents. We decided a few weeks ago that we were going to stop looking for now. We were settling for things that we didn't love just so we could buy a house. Which seemed crazy. Worker Man's parents have a double-wide trailer on land beside their company that they graciously offered to us. So, we have decided to fix it up and live there. [Don't worry, there will be before and after pictures :)]. We have affectionately dubbed it "The Taj". We can talk more about all of this later. Lots of things have been learned during this process. And lots of heart issues revealed. It has been very eye-opening. I'm excited to share :) But, we can talk about all of that some other time. We are so excited about it at this point. On top of Worker Man's parents allowing us a place to live for the last three months, and graciously offering us The Taj, they are also helping out with the renovation process. FMIL has been helping us paint. Which is a huge blessing considering I am terrible at painting. And I do mean terrible. But, she's a beast. And we are so thankful for her help. FFIL decided his contribution [yes, in addition to housing] was meals. After a week of Worker Man and I eating takeout and fast food at 10 pm [which disgusts me], he noticed this and offered to cook us supper every night. So while we work, he cooks and then we get to come home [home being Worker Mans parent's house] to a hot meal. And not only a hot meal. Seriously, FFIL is such a great cook. 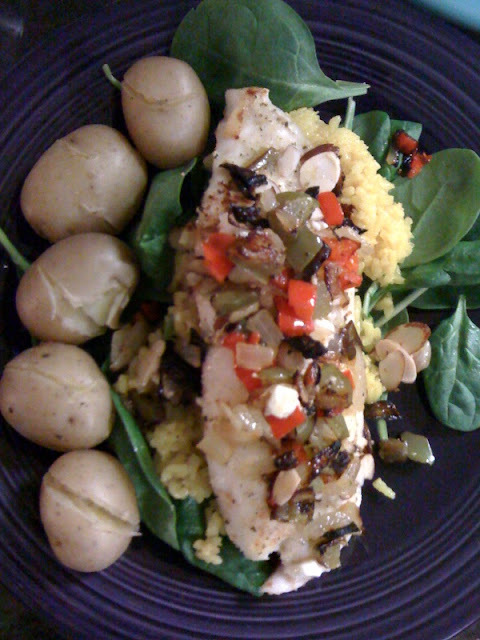 Tilapia, smothered in grilled peppers, onions and almonds. On a bed of spinach and saffron rice. With baby potatoes. [I'm definitely a carb girl - so he captured my heart with both potatoes and rice]. And topped with feta cheese. FFIL fixed my plate because he says "presentation is key". He told me he probably fixed me too much but that I didn't have to eat it all. But, I couldn't quit eating it. That's how good it was! Is this a blessing or what? I told Worker Man that I could only hope that some of that was genetic. Trust me, it is NOT genetic!